We serve Berks County, Dauphin County, Lancaster County, Lebanon County, and York County (most of the Susquehanna Valley Area). For anyone looking for extra-clean, affordable, Luxury Restroom Trailers, Portable Restrooms or Waste Management Services, Red Rose Sanitation Solutions in Lancaster County is the favorite choice for many. Each of our customers events are different and have special requirements. From upscale corporate events and parties to outdoor weddings and receptions with guest lists from 100-400 people, Red Rose Sanitation Solutions, Inc. has the solution to match the perfect unit with any event and budget. Click here for complete information. 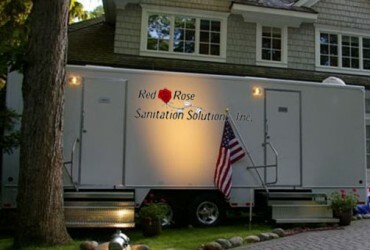 Whatever you want to call them, Red Rose Sanitation Solutions, Inc. has portable restrooms for any function. 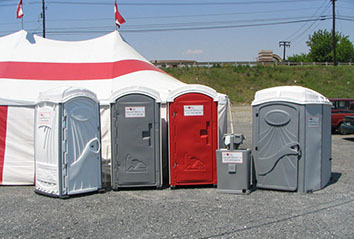 We just happen to prefer to call ours Portable Restrooms because of the care we put into our service and units. We have various styles suitable for: glamorous outdoor weddings, community and school sporting events, auctions, family reunions, construction sites, park services, or just for convenience at a remote location. Whatever the need, we have your solution! Click here for complete information. Red Rose Sanitation is ready to manage your waste transport and disposal needs. That includes Waste Transport and Disposal, Residual Waste Disposal and Hazardous / Non-hazardous Waste Removal / Disposal and Field Services. Click here for complete information.